forecast shown here. However, even though the track conditions may be wet, the temperature is in the lower 80’s for Friday, Saturday, and Sunday. Friday’s practice sessions will have to contend with up to an inch of rain and thunderstorms. The wind is relatively calm, 5-10 mph for most of the day. Teams will get good wet weather practice if they choose to run on Friday. Saturday’s weather is pretty much the same as Friday’s. Cloud cover throughout most of the day and a chance of rain. This could make for some interesting qualifying results. Sunday, race day, should bring some sun with it as the forecast calls for “mostly cloudy” and a 50% chance of rain. If it does start to precipitate during the race, it will be interesting to see how the teams and aero kits respond. We could start to see more modifications to aero kits to increase down-force if rain is expected during the race. 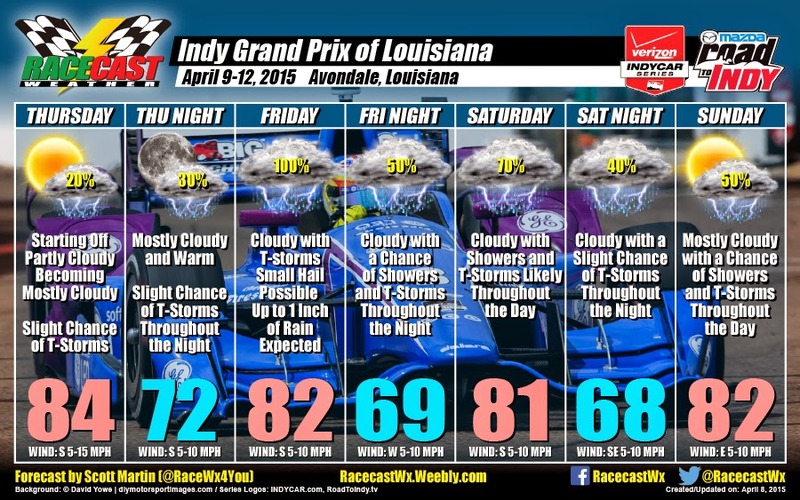 For a more detailed forecast and updates throughout the race weekend, follow Racecast Weather on Twitter.